I discovered Honey Boards on Facebook pretty recently and found the products so cool that I absolutely had to share them with you. They are handmade, one-of-a-kind serving boards made from cypress tree stumps and knees. It takes up to two weeks to cut, sand, dry and finish the boards. They’re finished with up to three coats of food-safe mineral oil and finally coated with beeswax from New Orleans, where they’re made. The company’s founders, Sarah and Kyle, came up with Honey Boards after just wanting to find a creative project to work on together. They first started with creating a cheese board with a piece of lumber and chalkboard paint, but then decided to take the idea back to their Louisiana roots by using cypress and the collection grew from there. Their latest collection is the Mardi Gras collection which is gold leaf around the edges. Everything is absolutely beautiful and I haven’t seen anything like these anywhere! 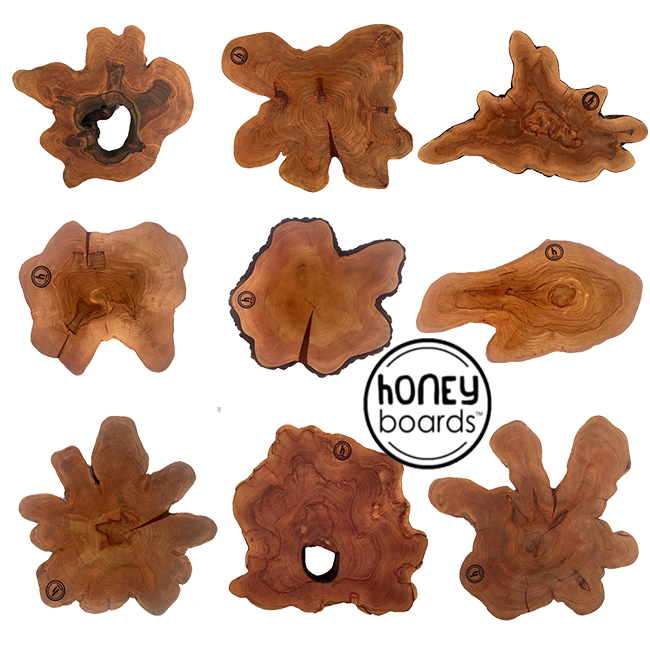 Honey Boards would make perfect gifts and come at a variety of price points. I love the idea of displaying one in the kitchen to add something unique and cool to our all-white kitchen and I might need another one for serving some snacks with wine out on our patio this summer. Check out the Honey Boards shop right this way!